Dita Parlo in L'Atalante (1934). 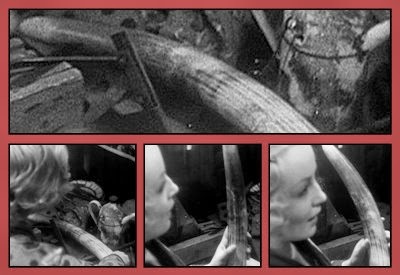 “It’s a regular curio cabinet!” Juliette (Dita Parlo) exclaims in Jean Vigo’s masterpiece L’Atalante (1934) as she discovers the strange and colorful items exhibited in the cabin of Père Jules (Michel Simon), the barge’s first mate. Exotic objects hang from the ceiling, are nailed to the walls, decorate the shelves, and rest on the floor. It really does look like one of those proto-museum displays that were known as “cabinets of curiosity” in centuries past. 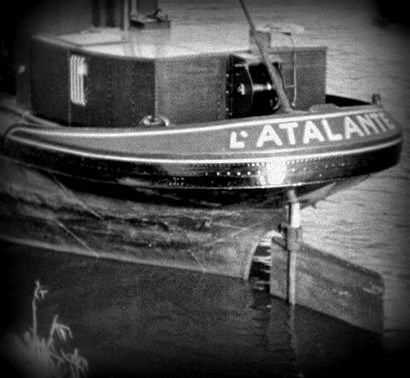 L’Atalante is an examination of a young marriage, focusing upon Juliette and Jean, her barge captain husband, as they journey along the Seine. While the details of the barge trip are often realistic, the relationships on board the barge (the young couple, the first mate, and a cabin boy) are conveyed more impressionistically. There are few characters on film quite as charmingly strange as Père Jules, the gruff first mate who appears to have lived a full and fascinating life. His cabin is our window into his soul. Père Jules is a man of the water, with a starfish and octopus nailed to his wall. Juliette holds a shell to her ear. And that’s a very impressive sawfish rostrum mounted on Père Jules’ bunk! 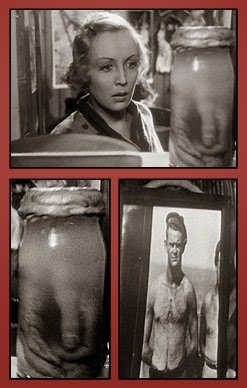 Juliette examines an anatomical specimen. 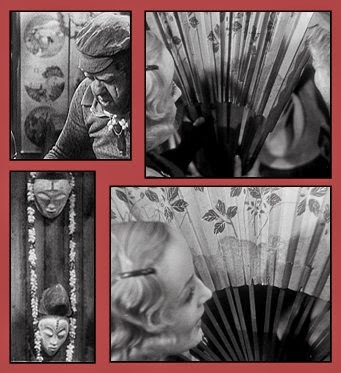 Screens, masks, and fans from abroad. Père Jules has traveled the world. From Asia, he boasts a large fan and a delicate painted screen. Masks hang on the walls. “Nothing but the finest things,” Jules explains. Although he shows restraint with Juliette, Père Jules is a carnal man. His paintings and photographs depict women in various states of undress, including nudes. The men in his photographs are shirtless, too. 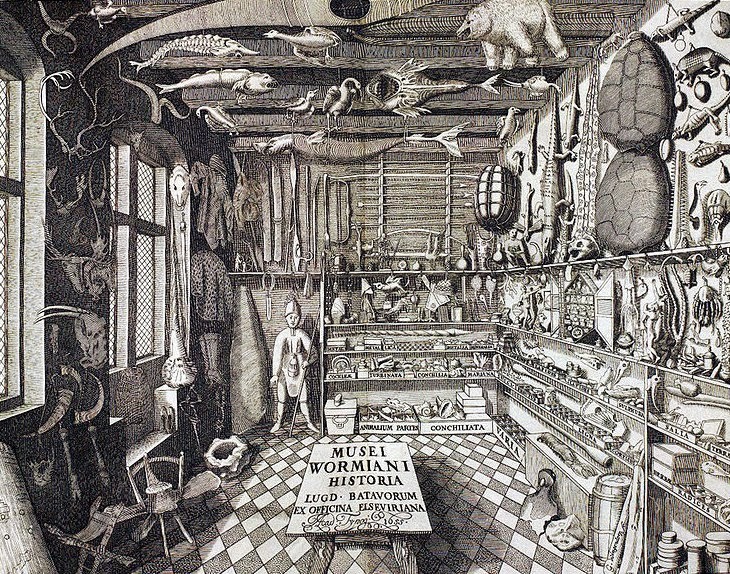 Historically, a cabinet of curiosities was intended to showcase the interests of the owner. These were the things that piqued the imagination of the proprietor. 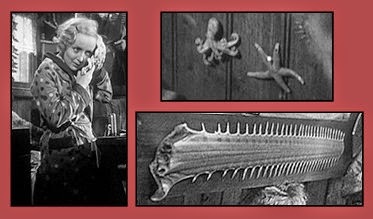 The links between the disparate objects provided insight into the unique personality of the host. When I was a boy, I had a museum in my basement. Lee’s Museum had a chemistry table, a biology section with specimens in formaldehyde, my pet iguana, shells, anatomy models, earth science displays, and lots of rocks and fossils. 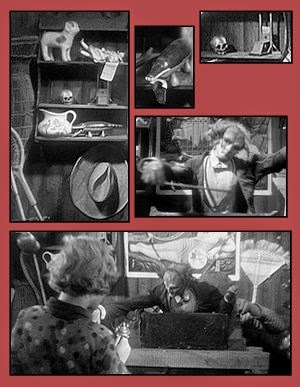 It was my cabinet of curiosities. 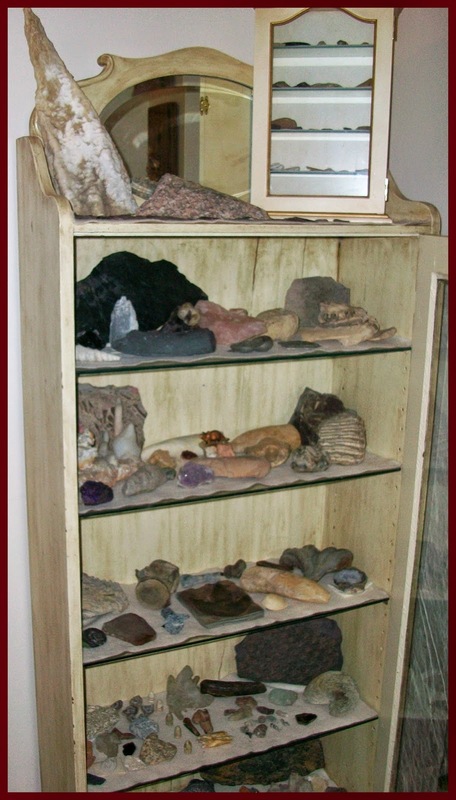 I don’t have one anymore unless you count my single cabinet of rocks and fossils.